Referrals hold immense power in the heart and mind of the corporate legal buyer. They are able to sway opinions and, in many cases, convince a client to take their business to a competing service provider. 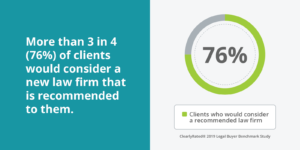 In fact, according to our 2019 Legal Buyer Benchmark Survey, referrals are a prospective client’s top resource when vetting potential law firms to work with. They’re so important that 76% of legal clients would consider leaving their existing firm if another one was recommended to them. Knowing that referrals are a leading strategy for winning new opportunities with prospects, what steps has your firm taken to measure “referrability” and identify clients who would be willing to recommend you to their friends and colleagues? At ClearlyRated we have found that a Net Promoter® client survey is the best place to start. The Net Promoter Score (or NPS®) survey asks your clients, “On a scale of 0-10, how likely are you to recommend our firm to a friend or colleague?” Promoters are clients who respond with a 9 or 10 rating on a Net Promoter Score survey, and they should be top of mind as you build out your client referral strategy. Your firm’s services are of good value, given their cost and quality. You’re proactive in helping them achieve their goals. Your team delivers high-quality and error-free work. You’re responsive and quick to reply to emails and voicemails. 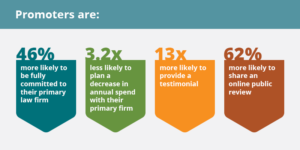 Findings from the 2019 Legal Buyer Benchmark Study show that Promoters are less likely to leave their current firm for a competitor and also less likely to decrease their legal services spend. Throw in that promoters are 13 times more likely to give you a testimonial and 62 percent more likely to write an online review, and that means both creating these promoters and identifying them can equal serious value for your firm. Aside from understanding what makes a Promoter — and potentially a referral — it’s also important to know what leads a client to respond with a 0 – 6 on the NPS scale. These clients are Detractors, and they represent a high risk to your brand as they are “not at all likely” to recommend your business to a friend or colleague. What’s more, not only are Detractors unlikely to give you a valuable referral, but they’re also more likely to post an outright negative review. 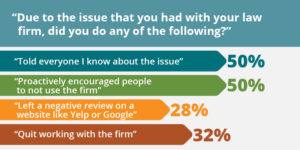 More than 1 in 4 corporate legal clients who have experienced a service issue with their law firm report that they left a negative review on a public website like Yelp or Google. And in today’s low-trust digital world, these bad reviews hold way more power than good ones. In fact, negative reviews have almost two times the impact as positive ones. So what makes a Detractor? When we asked corporate legal clients who had left their primary law firm in the last 12 months why they chose to do so, 44% said they left because of service failures. Service failures in this case include lack of responsiveness, errors or mistakes in the work, lack of understanding of the client’s business needs, and a lack of proactivity in servicing the client. Other Detractors say new leadership, increased costs and outgrowing the firm’s offerings also played a role in their leaving a firm. But service failures don’t have to mean an automatic “hit” to your firm’s reputation. When service issues are identified early and proactively (as with a client survey), they offer a unique opportunity to turn an unhappy customer into a long-term Promoter. Our studies show that of legal clients who have had a service failure, those who were “very satisfied” with the issue’s resolution reported a higher NPS score than clients who never had an issue in the first place. 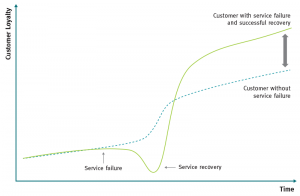 Educate yourself on the “service recovery paradox” – learn how a service failure offers the opportunity to win more loyalty with a client than if they never experienced an issue at all. Implement a clear process that helps your team master in the art of service recovery – we published our own 10-step recipe for recovering from service failures in a way that builds trust and creates win-wins. Trust is at historically low levels. According to Gallup, only 18% of consumers trust big business — even less than those who trust the media. Referrals, reviews and testimonials from real-life clients give you the opportunity to combat this distrust and build a credible reputation, both online and off. Are you ready to identify Promoters who can refer your firm and help build your reputation and client base? Consider implementing an NPS survey program. Contact ClearlyRated to learn about NPS for law firms today!